Above the Curve Review Part 2: Polish Addiction Set! As I said last time- ATC is an amazing indie company run by the super sweet Angel and Shawn. $1 from every single bottle is donated to Shriner’s Hospitals for Children! Their mission with Above the Curve is to raise awareness for Shriner’s Hospitals, and for scoliosis. See, more reason to buy polish (and be polish addicted)- you’re donating to a good cause! This collection is made up of Husbands Just Don’t Understand, Dusty Huntin’, What No Buy?!? !, and Lemming Have It! All 4 polishes are incredibly stunning holographic polishes. What No Buy?!?! has gold holographic glitter, while the other 3 all have a subtle bit of color shifting sparkle to them. All 4 apply absolutely beautifully- smooth, no cleanup needed. First up is Husbands Just Don’t Understand- which is true, they don’t! Mine tends to just smile and nod 😉 This is a beautiful dark teal holographic polish with a bit of a green flash to it. I used 2 coats with no topcoat. Like I said before- applied beautifully! 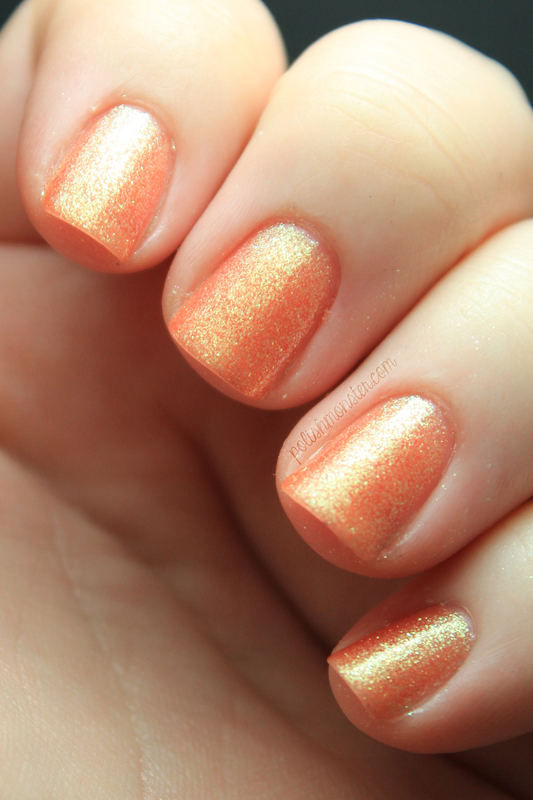 This polish is really stunning, especially outside in the sunlight where all 4 really shine. 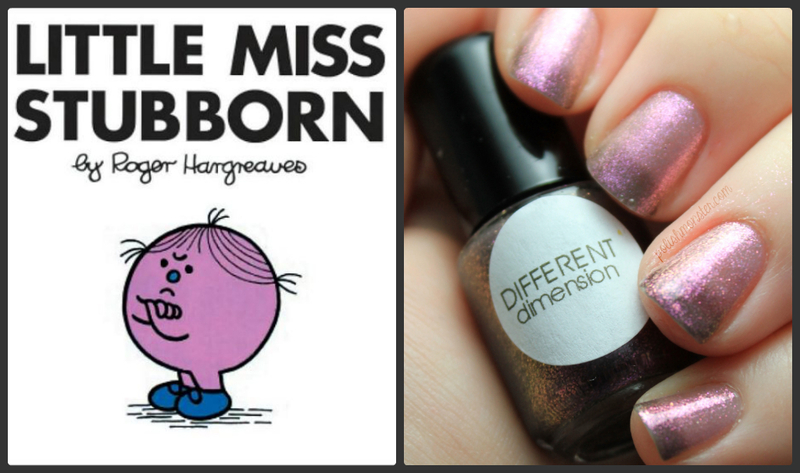 The second polish in this collection is Dusty Huntin’! If you’re unfamiliar with what Dusty Huntin’ is, it’s when you visit older salons to try and find valuable older polishes sitting ‘gathering dust’ on the shelves and buy them from the salon. Often they’ll sell them to you (used) for relatively cheap- they think they’re getting a great deal, while you, the polish addict, are overjoyed at snagging a hard to find beauty. This is a beautiful pink leaning red holographic polish with a beautiful purple flash. 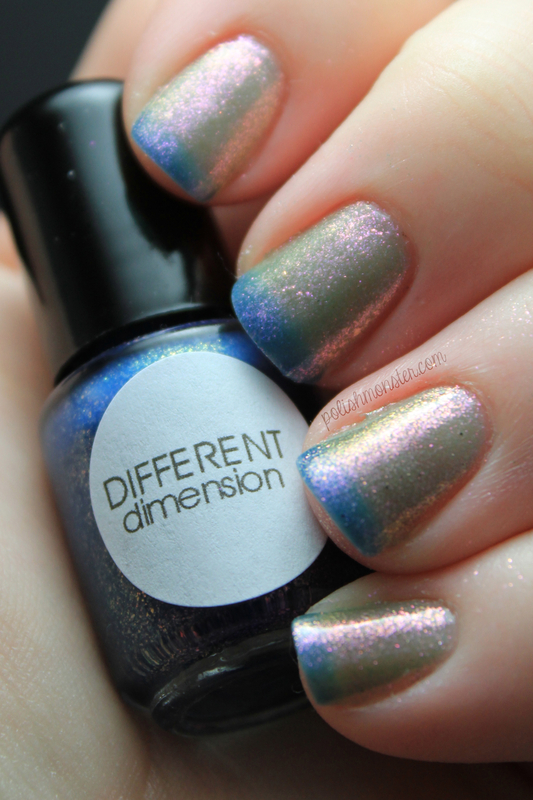 The holographic effect is a bit more faint on this one than the others, but it ‘s still a shining stunner! I used 2 coats with no topcoat. 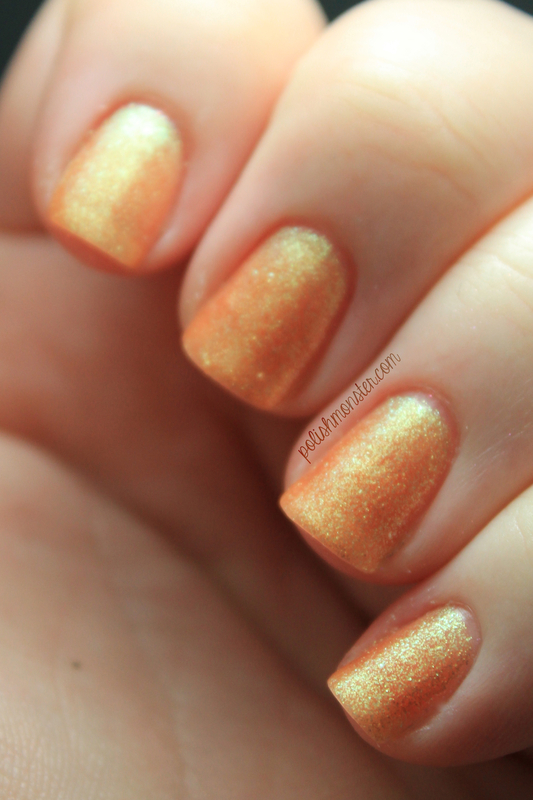 I don’t normally care for gold polish, but this one is super pretty, and worked well with my skin tone. And even though it’s filled with holographic glitter, it came off just as easily as the other holo polishes- no need for the foil method or excessive scrubbing! This is 3 coats with no topcoat. And last but certainly not least, is Lemming Have It!- my personal favorite, and seems to be a lot of people’s favorite. 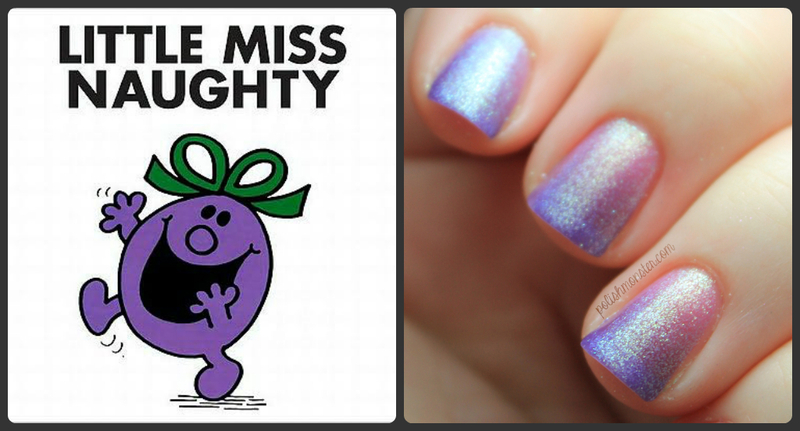 Lemming Have It is a drop dead gorgeous blurple holographic with a blue shimmering shift to it. The blue shimmer really comes out to play in sunlight- I couldn’t stop staring at my nails! This polish is easily tied for my very favorite ATC polish with Fallen Angel- both are must have polishes (unless you don’t like holographic polishes of course- but not many people dislike holos!). The extra shimmer flash in these is what really sets them apart and makes them shine. Interested in grabbing any Above the Curve beauties? You can find them in their Big Cartel store, their Etsy store, and also at Overall Beauty. You can also follow the ATC Facebook page for news and updates. Polishes range from $7 to $9 (for holos)- and don’t forget, $1 from every bottle is donated to Shriner’s Hospitals for Children! 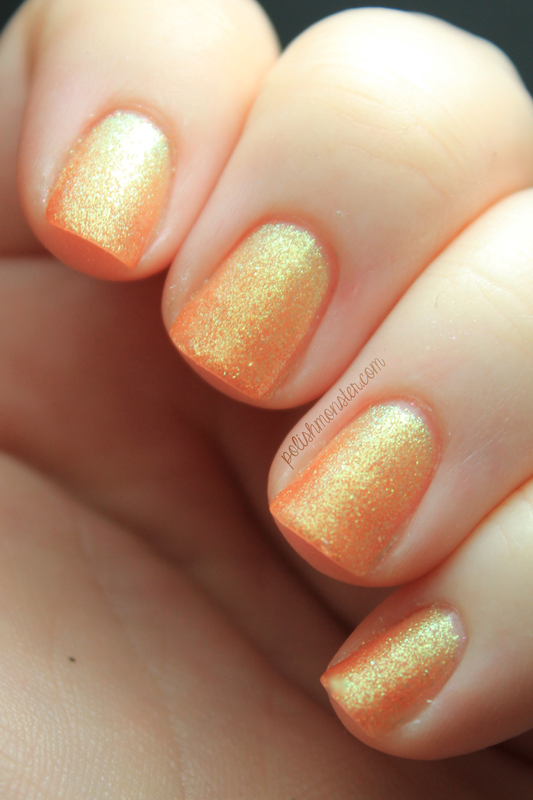 If you didn’t see it the other day, be sure to check out Part 1 of my Above the Curve polish review HERE! I am a little behind (I know this is terribly shocking, right? )- but my second part of my Above the Curve review is set and ready to go for this evening. 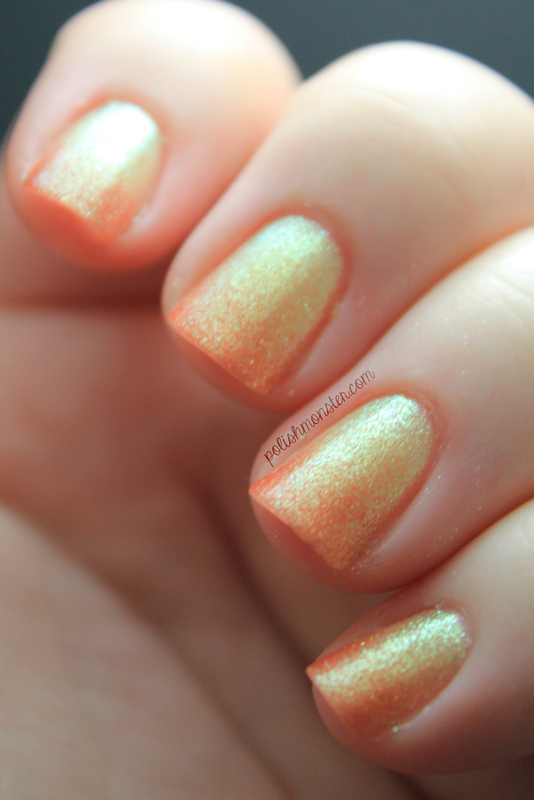 But in the meantime, I thought I’d post a quick mani I wore a few days ago. I’m up late writing this because it’s storming pretty heavily, and these polishes felt appropriate to show off! I chose to pair up I’m Only Happy When It Rains and Purple Rain- LOVE the result! Also- Lumina Lacquer is restocking tomorrow at 11:oo am PST (2EST/1CST/12MST)- so maybe this can add something to your wish list! First up is I’m Only Happy When It Rains, a beautiful light gray with a gorgeous blue-green sparkle. Sadly, this one isn’t being restocked today and may not return. 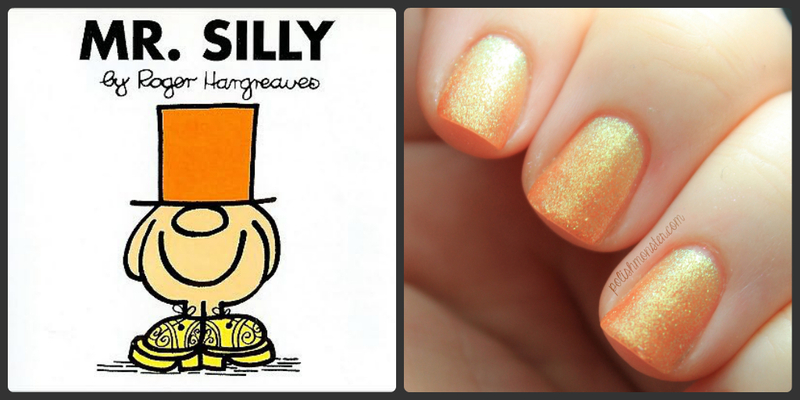 (You definitely have to grab Lumina Lacquers you love when you can- there’s never a guarantee they’ll be back!) This polish began as a custom for a friend, and I’m so glad Tatiana opted to make a larger batch for all of us to enjoy! I’m Only Happy When It Rains has great coverage- this is 2 coats. The shimmer is really obvious in person! It’s such a delicate, pretty gray color- and I’m definitely a sucker for gray polish! Then I added 1 coat of Purple Rain on top! Yes, ya’ll- that’s just 1 coat. 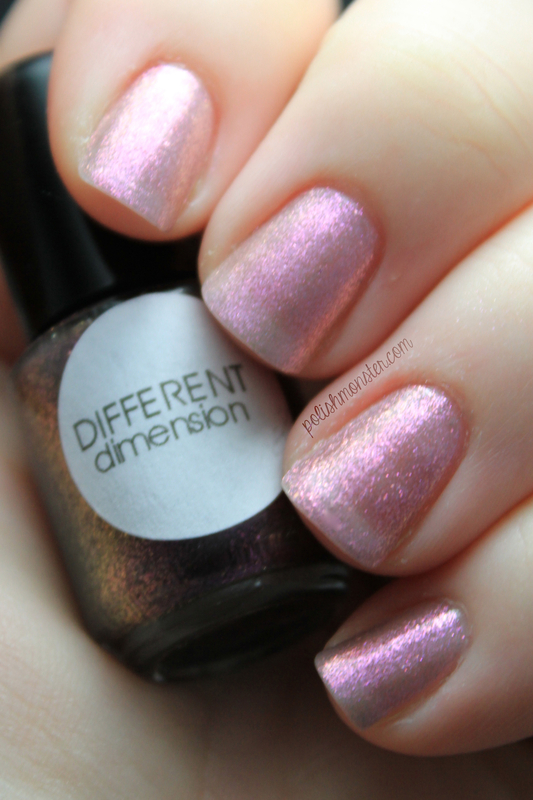 This is one tightly packed glitter bomb- which is what Lumina Lacquer does best in my opinion! 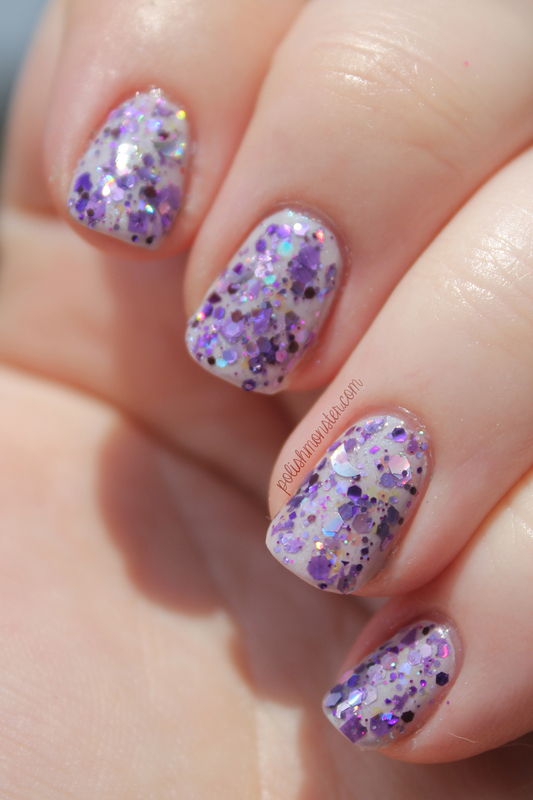 You’ll find just about every type of purple glitter in this polish- large, small, shapes, holos, even shards- all in there. 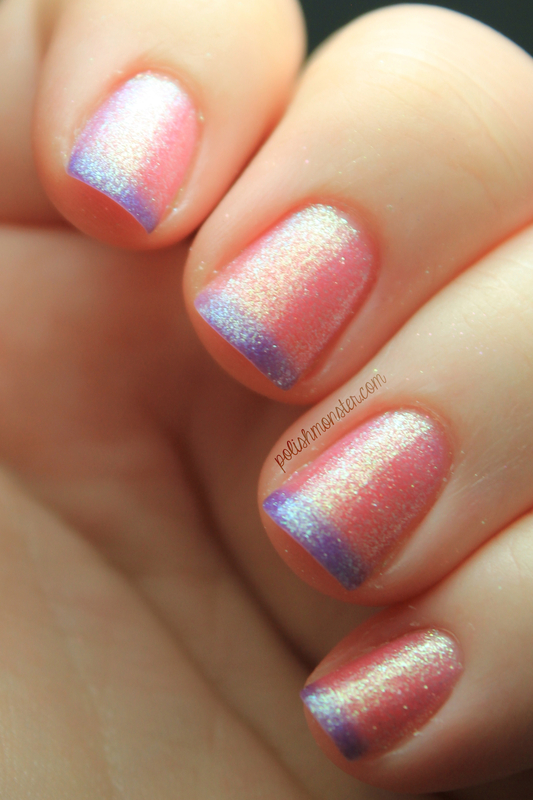 There’s even some beautiful iridescent glitters that peek through in the sun! I used the dabbing method to apply the glitters- if you’re wondering how to do that, you can follow this link to an amazing video by More Nail Polish showing exactly how! It’s a great way to apply glitter bombs like this one. Remember, Lumina Lacquer restocks tomorrow at 11am PST! You can visit her Big Cartel store to see the polishes being sold- Purple Rain is included, along with a lot of other amazing colors! And be sure to follow on Facebook and Instagram to keep up to date on new colors and restocks! Above the Curve Review: Part 1! Hi guys! I have a BUNCH of awesome polishes to show off today and tomorrow from Above the Curve! If you haven’t already heard of Above the Curve, they’re an amazing indie nail polish brand headed up by an awesome husband and wife duo! Angel and Shawn are some of the sweetest people you will ever meet- and on top of having amazing polishes, $1 from every single bottle is donated to Shriner’s Hospitals for Children! Their mission with Above the Curve is to raise awareness for Shriner’s Hospital’s for Children, and for scoliosis. You can read more about their story here on their Big Cartel site! 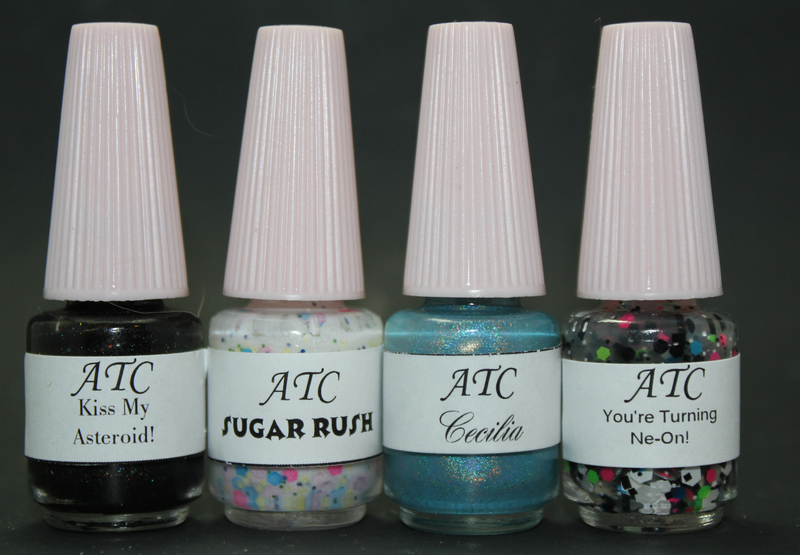 Today I’ll be showing some of their more recent additions to the ATC lineup: Kiss My Asteroid, Sugar Rush, Ceclia, and You’re Turning Ne-On! Tomorrow I’ll have the new Polish Addiction Collection, so be sure to come back- those are all AMAZING! As a note: every single Above the Curve polish I own applies perfectly (I’ve purchased a large number on my own in addition to review polishes). I didn’t have to do any cleanup for any of these photos with the exception of 1 nail on Kiss My Asteroid! 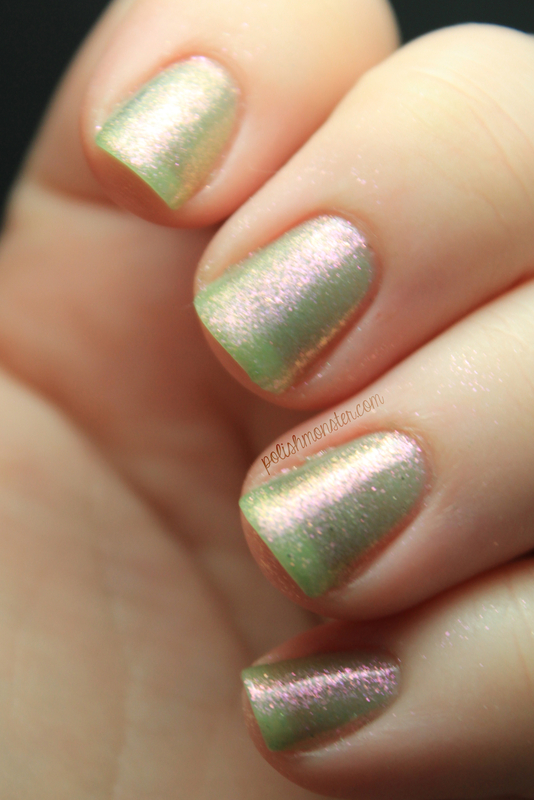 The holos all went on beautifully, right where I placed the polish- no pooling, no dragging, no bald spots. 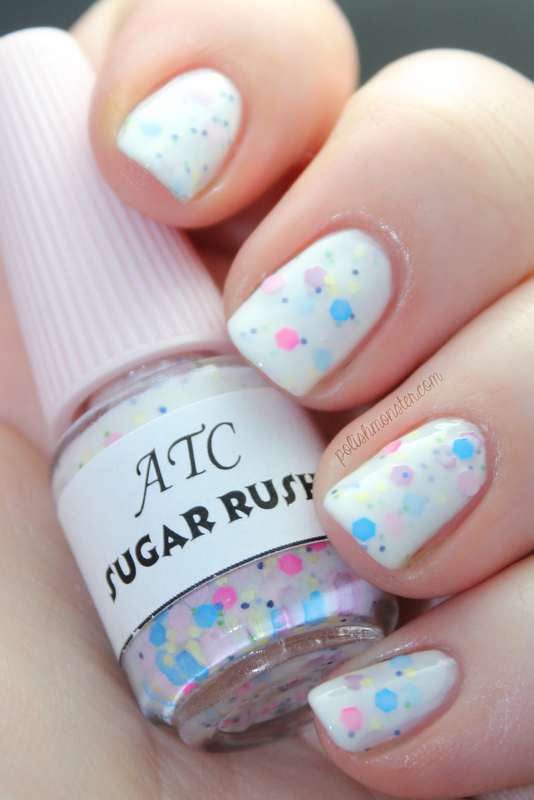 Many times, ATC polishes can be 1 coaters! I’m not sure that any indie brand I own applies as well as most of my Above the Curve polishes- which is high praise, because I am a self-admitted indie-aholic and adore many brands. Anywho- onward with the review! 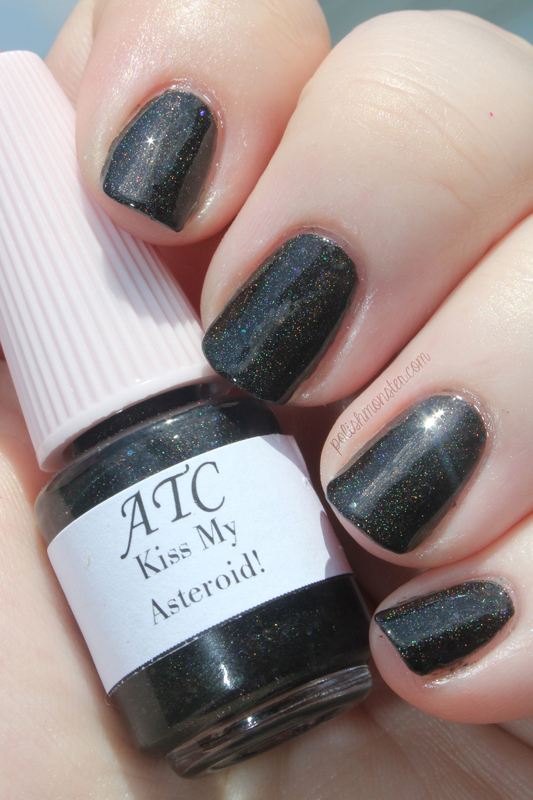 First up is Kiss My Asteroid!, a beautiful black holo filled with smaller black holographic glitters. This is 2 coats with no topcoat. I first took photos of all of these polishes inside in my lightbox, but I opted not to post those and waited patiently for a sunny day (we normally only have sunny days here in the summer- but of course when I want one, we get storms!). It was worth the wait- look at that sparkle! The larger sparkles you see are the black glitters peaking through. This looks mostly like a black linear holo polish, and those glitters give it a nice interesting pop that is a bit unexpected, but not overwhelming. Second up is Sugar Rush. This polish is full of different glitters in a white crelly base- I spy blue, navy, yellow, dark pink, lilac, and green hexes, and pink circles! I used 2 coats with no topcoat. This polish went on wonderfully- I sometimes run into issues with crelly glitter polishes with dragging, but the glitters went on well and didn’t require any special placement from me. I just love when I can see the different layers of glitter! Next time, I do think I would use a topcoat with this one. Like many times with glitter polishes, the glitters poked out a teensy bit from the base- a topcoat would smooth that out. Cecilia is an absolutely STUNNING teal/turquoise linear holo. I did 2 coats for photos (no topcoat), but this is one of those ‘could be a 1 coat’ polishes I mentioned- coverage was amazing. UGH, I die. 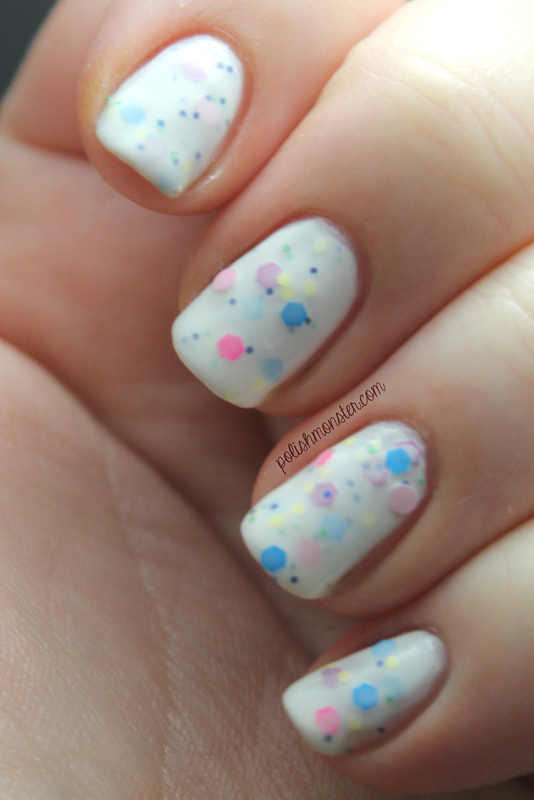 If there is one thing ATC does very, very well- it is polishes like this (and tomorrow’s post is more of polishes like this!). 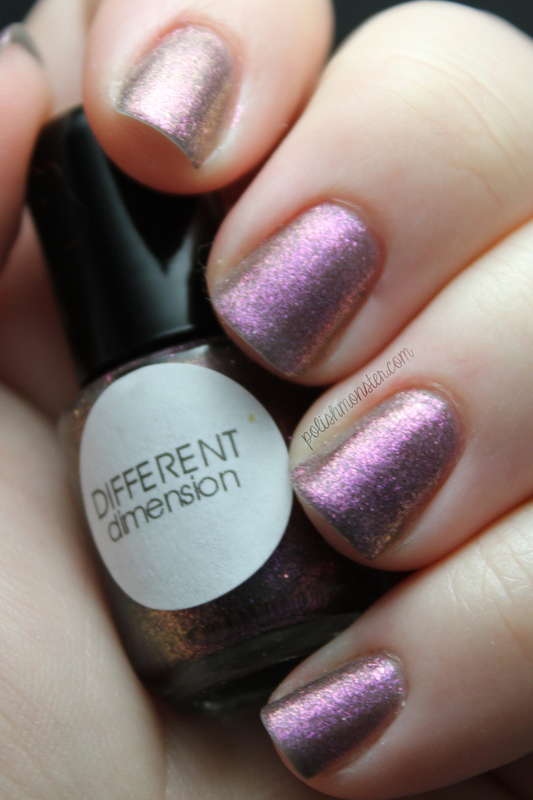 The coverage is FANTASTIC, it applies like a dream, the colors are always slightly different than things I already have and oh-so-pretty, and the holo effect is always linear and gorgeous. I may sound like I’m gushing, but I really can’t say enough good things about ATC holos. Everyone should own at least 1! And last but not least, I have You’re Turning Ne-On! You’re Turning Ne-On is a mix of white and black hexes, squares, and rectangles, along with blue, pink and green neon hexes in a clear base. I used 1 coat of You’re Turning Ne-On! over 2 coats of Weird Indeed’s PIVOT!. (And since someone may ask- sadly, you can no longer buy Weird Indeeds other than a lucky blog sale find. The creator quit selling last fall and I rarely see people parting with them). 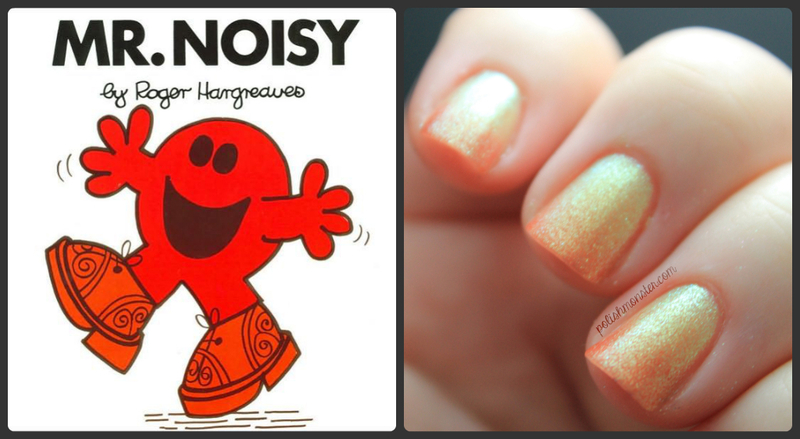 Ahhh, I love this polish! I will admit, since a majority of the shapes are larger, I had to do some fishing and the glitters were a bit stubborn. I also had to place them a bit (though not completely dabbing). It was worth it though, isn’t this fun? So that’s it for tonight! I’ll have my second post up tomorrow, so be sure to check back- they’re gorgeous too! Interested in grabbing any Above the Curve beauties? You can find them in their Big Cartel store, their Etsy store, and also at Overall Beauty (which I HIGHLY recommend- amazing service!). You can also follow the ATC Facebook page for news and updates! Polishes range anywhere from $7 to $9 (for holos)- which is a deal, especially considering $1 from every bottle goes directly to Shriner’s Hospital! 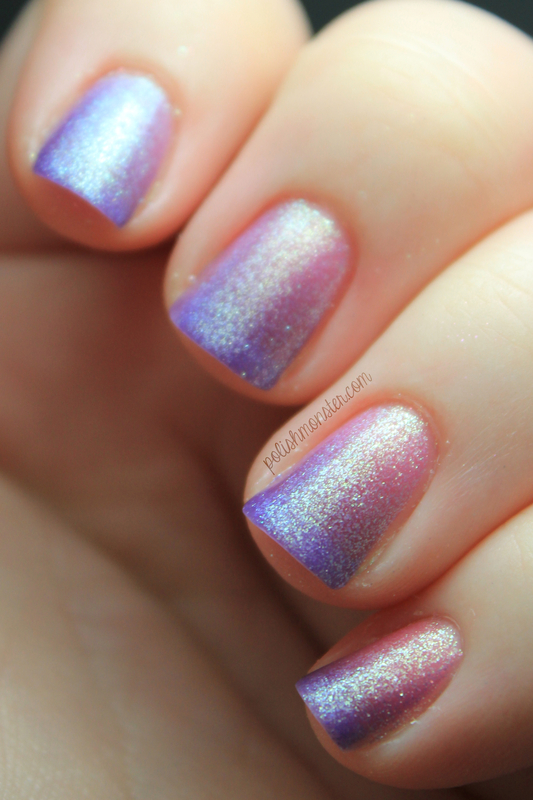 Today I have a new indie brand to show off- Fantasy Nail Lacquer! I love getting a chance to try out new lines that I’ve never used before 🙂 I received 3 shades to review- Camillia, Magic, and Sapphire Rose. Magic is available now, but Camillia and Sapphire Rose are new shades due to be released later this week! First up is Camillia, a beautiful pink! You all know how I love my pinks! 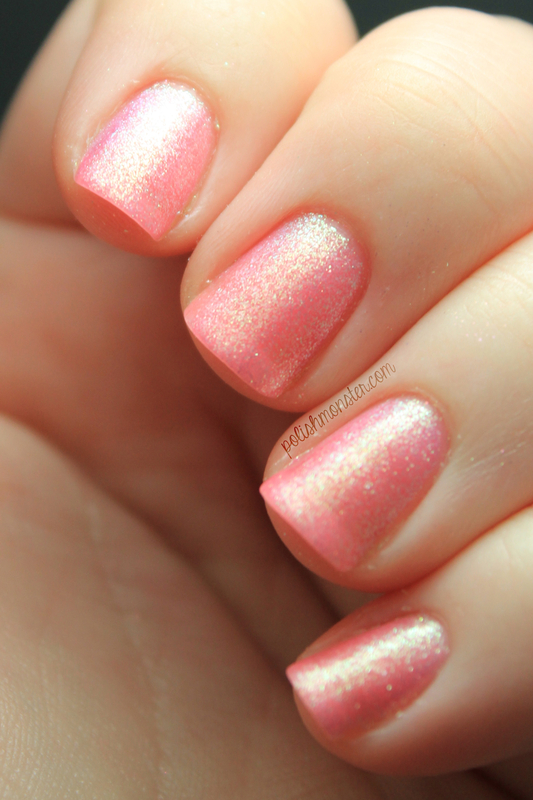 Camillia is a pretty rose pink filed with fine silver holographic glitter. The picture above shows Camillia inside in my light box, the second 2 photos show it outside on a sunny day. All 3 of these colors were beautiful inside, but they popped outside in the sun! My camera wasn’t able to pick up all the sparkles these were showing off. The lightbox photos were taken this weekend, and used 2 coats of Camillia. The outdoor photos were taken yesterday, and used 3 coats. I trimmed my nails down a tiny bit in between (*squee! * my first time in awhile cutting my nails shorter by CHOICE!). Camillia dried a tiny bit matte (maybe a bit of a suede finish? ), so I chose to add a coat of Essence Gel-Look topcoat to really bring out the shine. Application was smooth and easy. I did add a few drops of thinner to all 3 polishes, but that’s not a necessity- I just prefer to do multiple thin coats rather than 2 thick coats. Magic is a gorgeous grey jelly polish filled with ultrafine silver glitter and fine holographic purple, pink and blue glitters. Like with Camillia, the first photo is inside in my lightbox and the next 2 are outside in the sun. The first photo shows 2 coats of Magic, the second 2 photos are both of 2 coats. Coverage was really really outstanding for a glitter/jelly polish. You get pretty good coverage with just 1 coat, but things are completely opaque with 2. My nails were sparkling like crazy outside! This reminds me a little of OPI’s Excuse Moi! and other polishes that are filled to the brim with microglitter and cover so well. Because of how much glitter there was, this polish was a little thicker but nothing hard to work with. Last but not least, we have Sapphire Rose! This is just like Camillia, only in a bright beautiful blue. 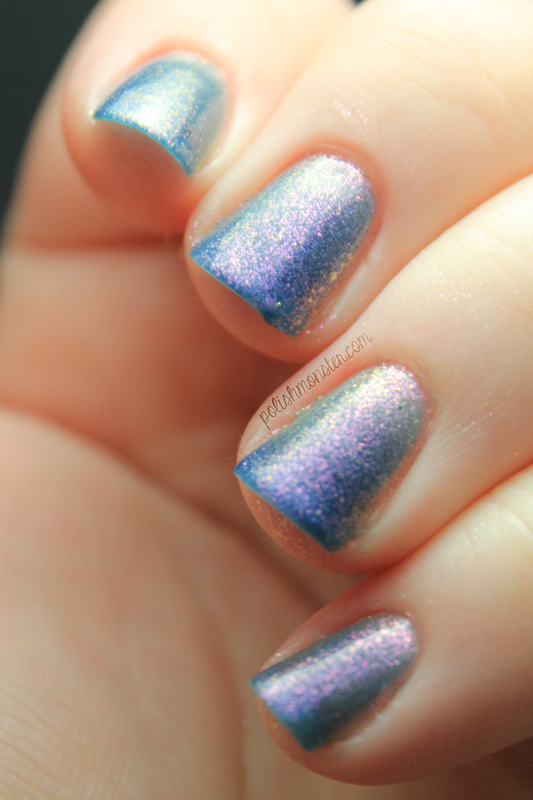 Sapphire Rose is a pretty sapphire blue filled with fine silver holographic glitter. Like the other two (no surprise by now I’m sure), the first photo is 2 coats in my lightbox, and the second 2 photos are 3 coats outside. Like Camillia, Sapphire Rose dried a tiny bit matte (more like a suede), so I used 1 coat of Essence Gel-Look topcoat to bring out the shimmer. Application was great, and went on wonderfully. Aren’t these colors so pretty? If I had to pick a favorite, it would have to be Sapphire Rose (I didn’t pick the pink, what?! )- the blue is just so bright and pretty and really pops with all the sparkles in the sunlight. You can grab Magic along with other gorgeous colors right now in Fantasy Lacquer’s Etsy Shop for $8/full size and $4/mini size- Camillia and Sapphire Rose are going to be released this Saturday, June 15. Be sure to follow the Fantasy Lacquer Facebook page to keep up to date on news and new releases!